Every woodworking project has its particular bonding requirement: contact cement for plastic laminates, hide glue for restoring antiques, Titebond for waterproofing, or Gorilla Grip for strength. Theres many types of wood adhesives to choose from, and each has its niche. Woodworking glue is key in wood joinery. Youll need it for dovetail joints and box joints. Before modern glue formulations made the scene, furniture and components of log cabins were secured by innovative joints, wooden pegs, or nails. Non-glue methods posed problems. In colonial days, carpenters didnt go to home improvement stores (Ye Olde Home Depot?) and buy a bag of 16p nails. Rather, they used heavy gauge wire to make their own nails. And they were so valuable they were reused when possible. The beneficial aspect of modern woodworking glues? Theyre affordable, they hide joints, and they do not rust. Which glue is the best choice for your DIY project? That decision is as critical as the appropriate wood finish, or for that matter, using the correct saw for the job. Contact cement is spot-on for many wood projects. Plastic laminate is the best example. Its used in that capacity for counters and kitchen and bath backsplashes. What makes contact cement so well-suited for laminate?? Initial grab, high strength, and its waterproof when dry. Its usually a neoprene-based compound. High-quality contact cement formulations are manufactured by Dap, 3M Fastbond, Titan DX, and Loctite. When using this construction adhesive, spread it on both mating surfaces. Wait for it to become tacky, and then press both bonding surfaces together. Do it carefully; when they advertise initial grab, they mean theres no do-overs here. Carpenters Tip: When gluing Formica to plywood, place lengths of dowel in between the two mating surfaces. Take them out one at a time while mating the surfaces. Work out air bubbles using a J-roller. Take your time and watch the details. Carpenters yellow glue is probably the kind that many homeowners have in their shop cabinet. It has long been referred to as the Swiss Army Knife of glues. Its a polyvinyl acetate-based glue. Carpenters glue is known for a very long open time. This makes it an attractive choice for projects that need complex clamping. Elmers and Dap are a couple of the leading manufacturers of yellow glue. Carpenters Tip: Save the fine-grain sawdust from your woodworking project. Mix up a paste of glue and sawdust. Use it to putty the joints and nail holes. Its frugal and it makes a perfect match! Hide glue is the traditional glue used for wood joinery in what we consider to be antique furniture. Its name originates from animal hide. Its formulated from collagen harvested from cattle hide and connective tissues. Is it still used today? Sure, just not as much as it used to. 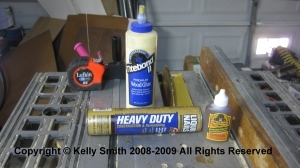 Hide glue is still the recommended glue or constructing stringed musical instruments. When bought its usually in a powder from. To prepare it, mix it with water at a 1:1 ratio. Recently, Titebond Liquid Hide Glue has been introduced, but its not that easy to find. Its always available at Rockler Woodworking and Hardware Superstore though. Carpenters Tip: Be sure to use hide glue whenever restoring antique furniture if it was originally used; otherwise, the piece will sacrifice its antique status. Believe me, the antique roadshow guy can tell! Titebond has developed a family of woodworking glues over time and it is really an ongoing evolution. This can be inferred from the name (I, II, III?). The latest kid on the block, Titebond III, has a very user-friendly open time of 10 minutes. It offers a strength of 4000 PSI, and always good thing, its the most waterproof woodworking glue commercially available. Polyurethane wood glue can offer a surprise to the first-time user. Apply it, clamp it up, and all seems right with the universe. But as it begins to cure, it looks like an alien spore attacked your project! Polyurethane glue reacts to good old H2O as it cures. In fact, the instructions will tell you to sponge wipe the open grain before joining the pieces. The more it cures, the more it expands. The more it expands, the more it bubbles out of the joint. So be sure to employ plenty of clamping. Carpenters Tip: Another good thing to do is to lay wax paper under an place where squeeze-out is likely to fall. Also, use wax paper between the clamp jaws and the project itself. This is very strong glue and works well on most woodworking projects. Gorilla Grip is one of the the major manufacturers of polyurethane glue. OK, liquid nails is a construction adhesive, not really for finish work. I just thought I would mention it here in passing since there are times when it comes in handy. For example, when I was installing transition molding for a laminate floor in my house, my slab kept chipping out when I tried to nail down the metal retaining rail. The solution? I just glued it down with Liquid Nails. Yes, I know its not usually recommended but six years later, its still holding up.